When you reach the last month of the year it is time to reflect upon the last year and our time spent in the beautiful Perigord/Daglan: the friendly people who always stop and say hello, the gorgeous countryside, medieval villages, fresh food, sunshine the list goes on. So here are just a few of our favourite things. 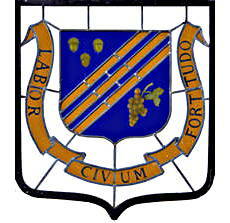 We love the wine and liquors of the area. However, I do think that the lady below has had just a few too many grapes! 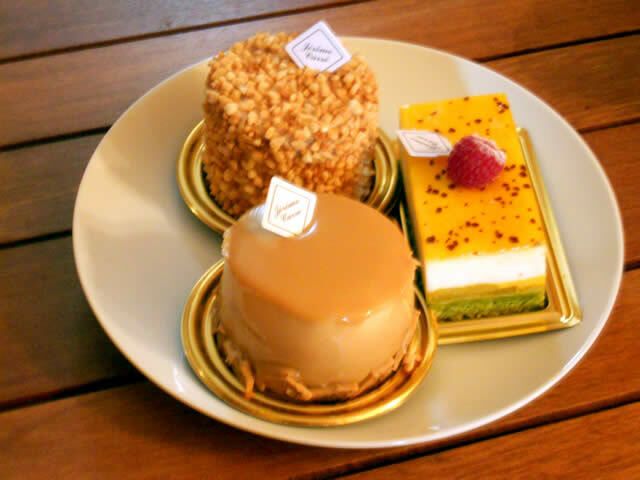 This is one of our favourite Patisseries, Maison Carré at Castlenaud. One look and we had to buy a few. 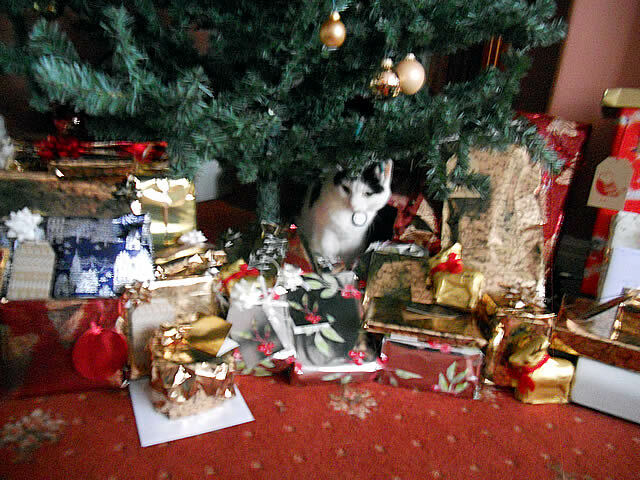 This will be our last ‘blog’ until January, so Merry Christmas (Joyeux Noel) to everyone, and thank you so much for reading our ‘blog’ the comments were unexpected but really appreciated. 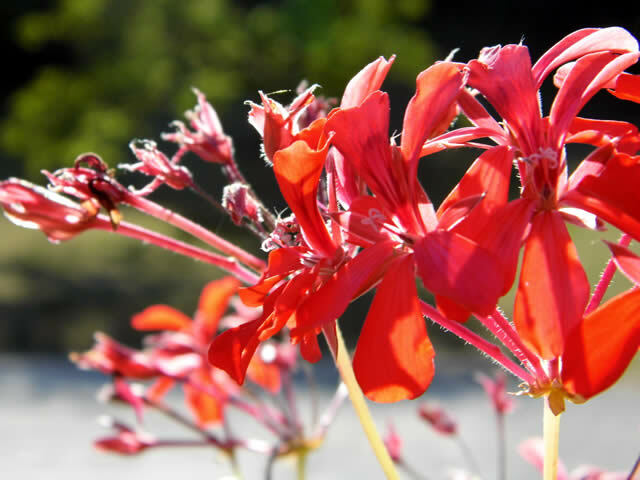 When I first started to write a ‘blog’ I did not think that many people would read it, I was presently surprised. 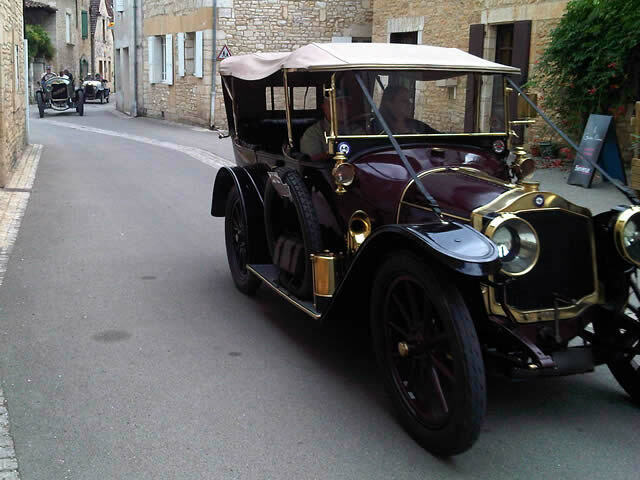 For vintage car enthusiasts the Perigord Noir is a dream come true, for it seems that most weekends during the Spring, Summer and Autumn months you will see a plethora of vintage cars, being driven around from one village to the next. These can be organised rallies, vintage car shows or just for the fun of getting together with fellow enthusiasts to enjoy the ride. 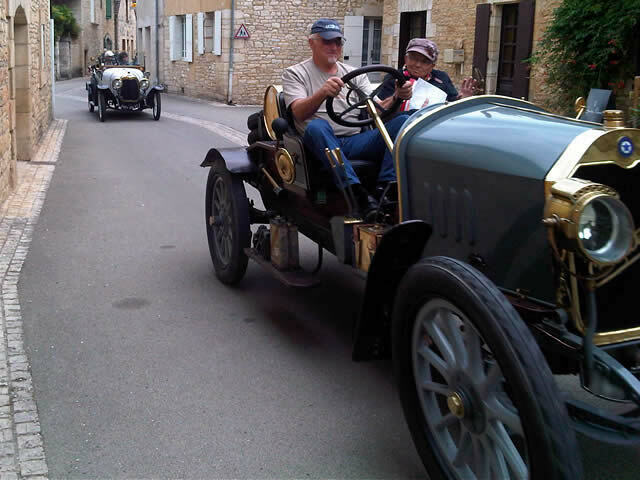 Paul and I were walking back from the post office one morning when we heard a car approaching, on the narrow road we stop to let the cars past, what a delight it was to see the vintage cars. 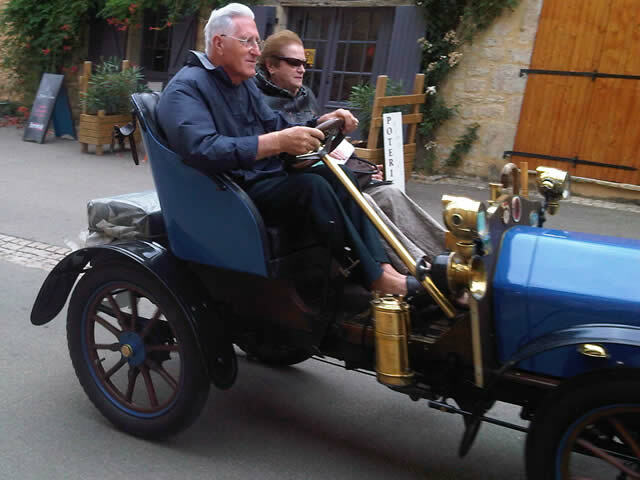 Just look at the determination on the drivers face, he was second in the event through our village. This driver was a very laid back in third place. He was waving and smiling at everyone. This was my favourite car, what a beauty. 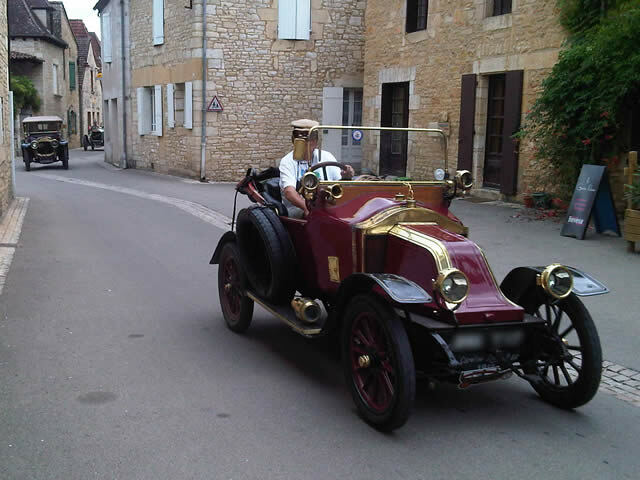 Sometimes you will see the driver and passenger dressed in costumes of the time period. This driver was wearing the correct hat, I think it was a little bit warm for the full outfit. 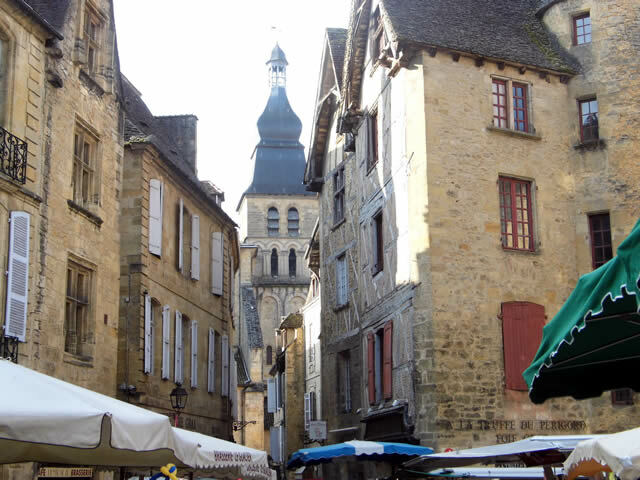 Most of the gorgeous buildings you see in Sarlat were built in its Golden Age of the 1440s: the hotels or town houses were built between 1450 and 1500 and grace Sarlat with a rare architectural unity. As soon has you start to walk down its old town streets you feel like you have walked back in time, the style and history are superb. 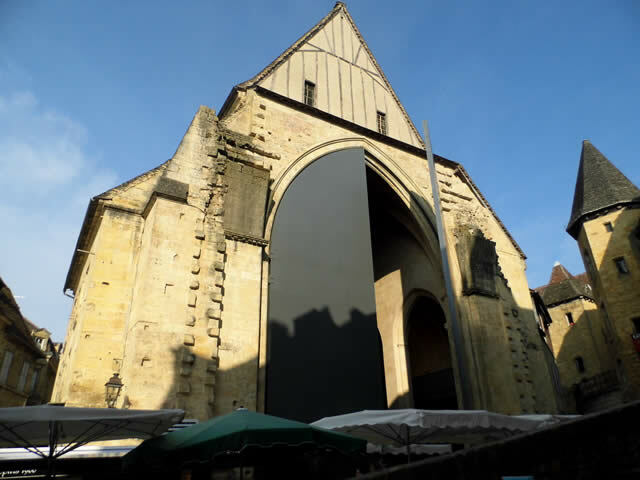 The architect Jean Nouvel who won the Pritzker Architecture prize in 2008 has transformed Sainte-Marie church in Sarlat into a covered market, therefore rejuvenating the building which was built in 1365. 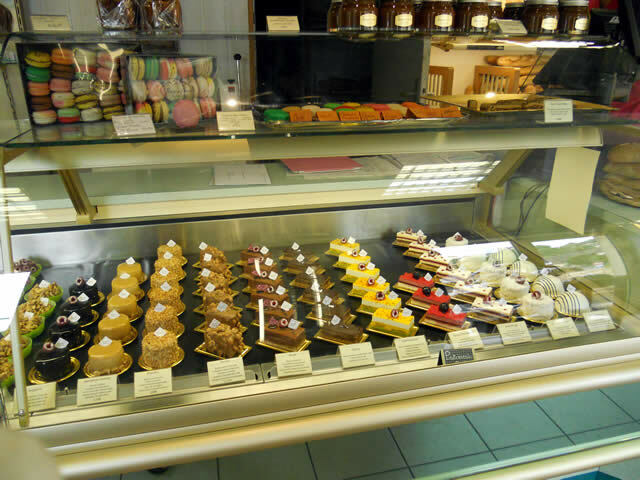 As I mentioned in a previous ‘blog’, they sell the most wonderful macaroons, walnuts, wine, cheeses etc in the market. Sainte-Marie church, just look at the massive doors! 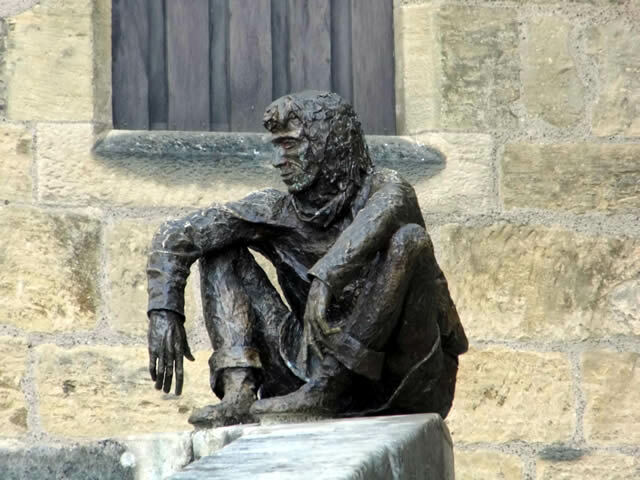 A bronze sculpture of the sitting man lost in meditation (Le Badoud) by Gerrard Auliac Rampe Magnanat (2002). Sitting on a stone step he looks at the market square, overlooking the Grand Place de la Liberte. 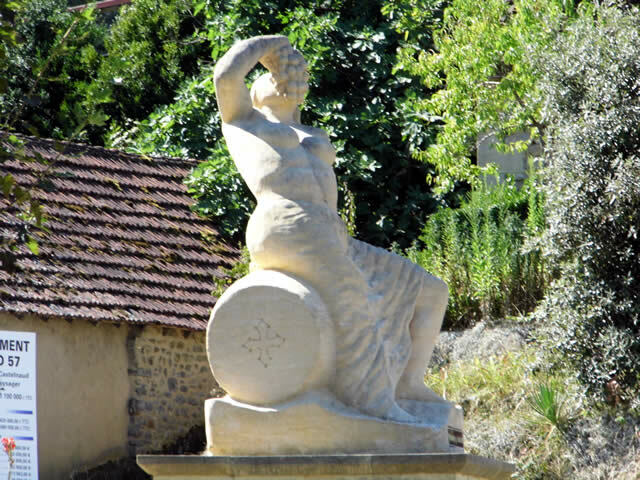 Around thirty films have been shot in Sarlat, including ‘The Musketeer’ the 1978 version of ‘Les Miserables’ and ‘Ever After’ starring Drew Barrymore. 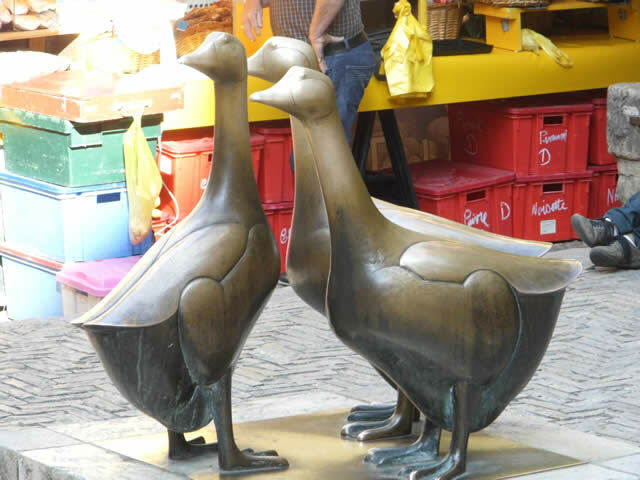 The geese are a tribute to the local speciality of foie gras. 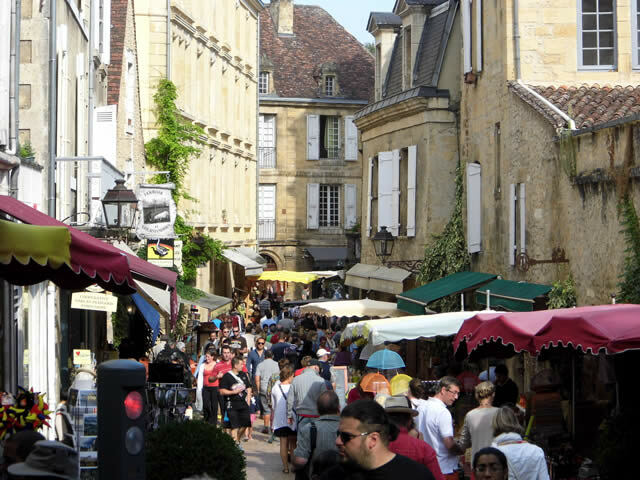 Sarlat Market, I love it. 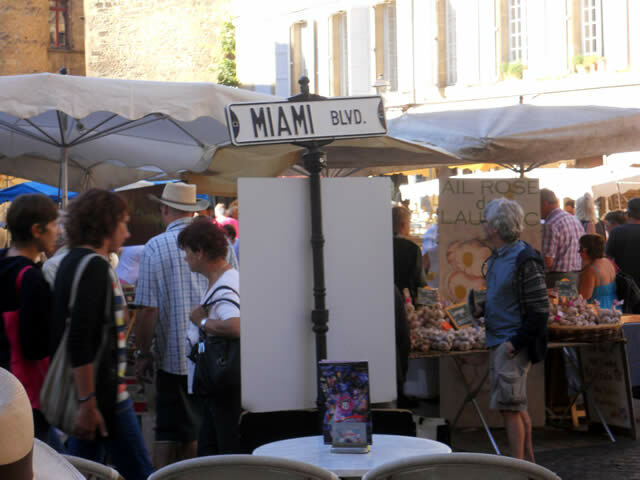 While I was writing the previous ‘blog’ (Christmas market in Sarlat) it reminded me of the last time we were there in September. We have so many pictures that I have split them in two: – the market (I love it) and the architecture (even more pictures to follow). 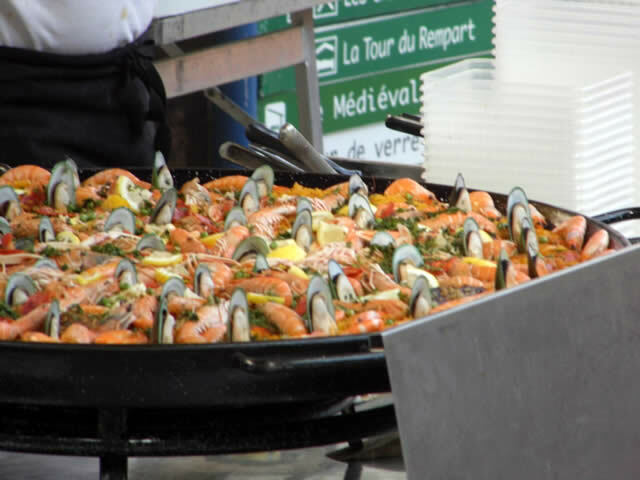 Every Wednesday is the food market yet every Saturday is everything from food, clothes, tablecloths, gloves etc to books and furniture. The down side is that it is always busy so go early. I wish that you could smell the different aromas from the pictures below and they are gorgeous:-the spices, chesses, chocolate, nougat and fresh vegetables and fruit, delicious. Just to walk around and not buy anything while soaking up the atmosphere is a real joy. However, if you are anything like me then take a large basket with you to fill with the local produce. 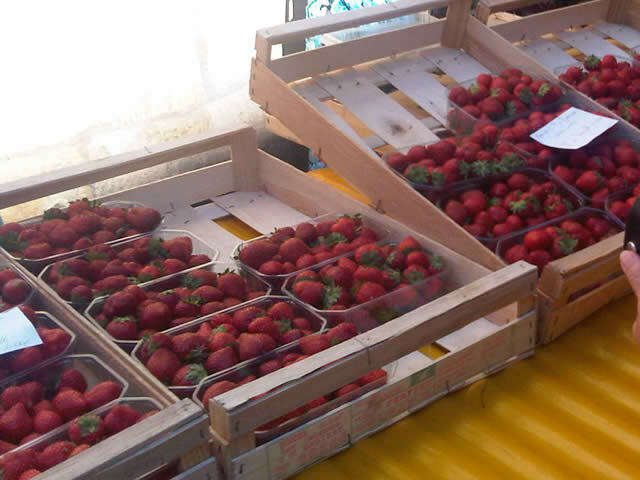 Many stall owners stand in exactly the same place every week, which is great when you want to purchase say, fresh strawberries. 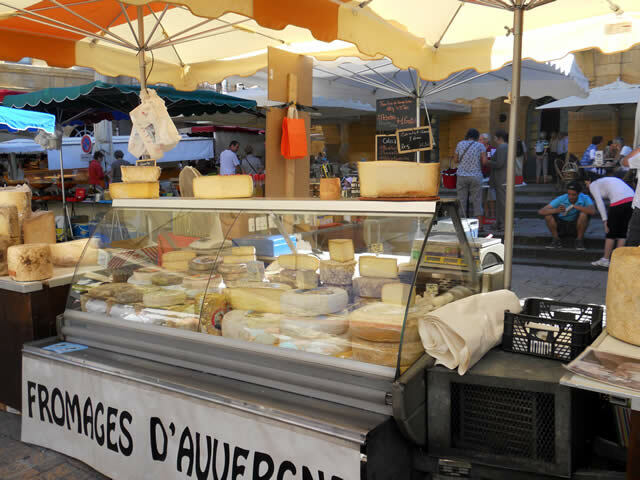 The selection of cheeses is great and you can usually taste before you buy. 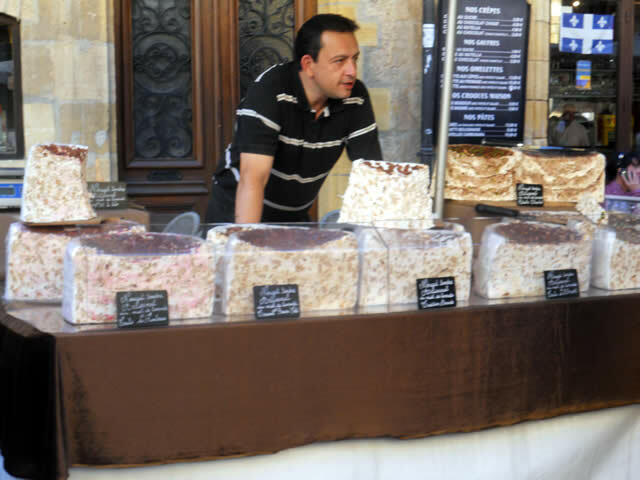 Delicious nougat with cherries, or chocolate and nuts and some with all three. The taste of a freshly picked strawberry is out of this world. Our son Adam says that he is ‘strawberried out’, due to the fact that every time we visit the market we buy punnet after punnet. It’s still early and you can see that sales have been brisk. This is a sign outside an American style café which we always stop at for a coffee and a spot of people watching after a hard morning shopping.